Two of the tournament’s greatest competitors were duking it out, right here on Table 4! Vincent Paglia won his way to Worlds back in 2010, while Thomas Mak represented the United States at the World Championship in 2011. Both competitors have multiple YCS Top Cut showings under their belts, and Mak won YCS Chicago earlier this year. Now, both had their sights set on a second shot at the World Championship title. Paglia’s playing Traptrix Hand Artifacts, while Mak is running Geargia. Let’s see how it goes. Mak opened with a hand of Geargiaccelerator; Geargiarsenal; Soul Charge; Mind Control; Solemn Warning; and Geargiano Mk-II. He Summoned Geargiarsenal, Tributed it to Special Summon Geargiarmor in Defense Position, then flipped it face-down with its effect. He Set Warning to back it up. 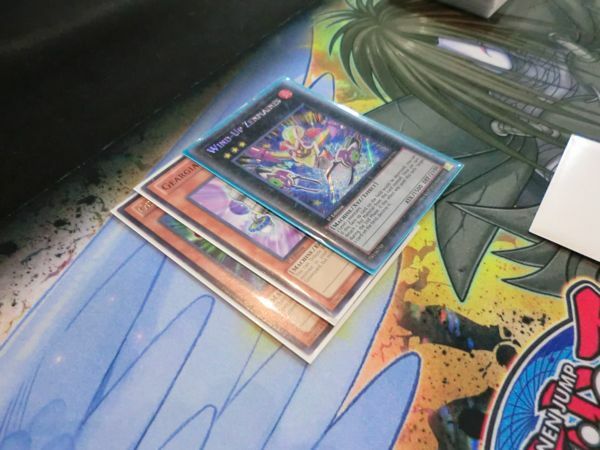 Paglia Summoned Cardcar D, Set one to his Spell and Trap Card Zone, then used Cardcar D’s effect to draw two cards and end his turn. Paglia Summoned Ice Hand and swung into Gear Gigant X, losing his Special Summon to Mak’s Solemn Warning! Paglia Set three cards to his backrow. Mak drew for his turn and Paglia bounced Gear Gigant X back to Mak’s Extra Deck with Gear Gigant X, again keeping him off that search ability. Mak pressed on, Summoning Geargiarsenal to Special Summon Geargiano in Defense Position. Mak overlaid both “Geargiano” monsters for Soul of Silvermountain, but Paglia responded with Call of the Haunted, bringing back Moralltach to destroy Soul of Silvermountain with Moralltach’s ability! Mak played Soul Charge to bring back Geargiarsenal, Geargiarmor, and two Geargiaccelerator. Mak paid his 4000 Life Points, dropping to 2000 to Paglia’s 6100. He overlaid Geargiaccelerator and Geargiarmor to make another Gear Gigant X, then detached Geargiarsenal to retrieve Geargiano Mk-II from his Graveyard. He overlaid for Number 101: Silent Honor ARK next, taking Artifact Moralltach and leaving Paglia with one card Set and two cards in hand. Mak Set a Spell or Trap, unable to attack due to Soul Charge. Paglia returned D.D. Crow, Ice Hand, and Cardcar D from his Graveyard to his Deck next turn with Pot of Dichotomy, drawing two more cards for its effect. He Set two cards to his backrow, Summoned Cardcar D, and drew two more with its effect, ending with four in hand. Mak drew Compulsory Evacuation Device, holding Geargiano Mk-II and Mind Control. 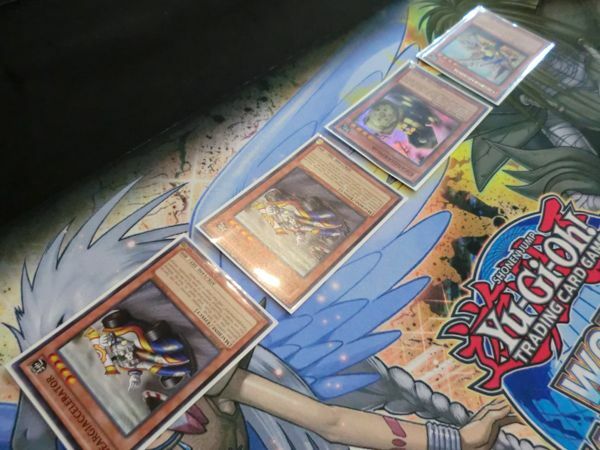 He detached for Gear Gigant X again, this time searching his Deck for Genex Ally Birdman! He Normal Summoned Geargiano Mk-II, activated its effect, and lost his Geargiano to another D.D. Crow. He Special Summoned Geargiaccelerator, returned it to his hand to Special Summon Birdman, then entered his Battle Phase to attack with Mk-II, Birdman, Ark, and Gear Gigant X for game! Paglia got the second Duel started with Traptrix Myrmeleo, searching his Deck for Bottomless Trap Hole. He Set three cards to his Spell and Trap Card Zone. This time around Mak had a hand of Wiretap; Torrential Tribute; Geargiarsenal; two Geargiano Mk-II; and Traptrix Trap Hole Nightmare. He Set everything but one Geargiano Mk-II and the Geargiarsenal. Paglia fell for it, activating Nobleman of Crossout to banish Mak’s Geargiano Mk-II! He attacked with Traptrix Myrmeleo for 1600 Battle Damage, then Set two more backrows. Mak drew Geargiagear and Set it. Paglia hit him for another 1600. Mak drew another Geargiagear and Normal Summoned Geargiarsenal, drawing out Bottomless Trap Hole. He flipped the Geargiagear from last turn, and when Paglia Chained Wiretap Mak Chained his own to Special Summon Geargiano and Geargiano Mk-II from his Deck! He overlaid them for Number 101: Silent Honor ARK, attacked to destroy Myrmeleo, and Set one more backrow card. Paglia Set a fifth backrow himself. Mak drew Mystical Space Typhoon and made a direct attack with ARK, drawing out Paglia’s Artifact Sanctum into Artifact Beagalltach; Paglia opted not to destroy any of his own cards, trying to brickwall ARK’s 2100 ATK with Beagalltach’s 2100 DEF! Mak destroyed it with Traptrix Trap Hole Nightmare, and ARK’s attack went through! Paglia was down to 5400 Life Points. Mak Set another card to his Spell and Trap Card Zone. Mak drew Soul Charge and attacked for another 2100 Battle Damage. Paglia dropped to 3300 Life Points. Mak drew Geargiarmor and attacked once more – Paglia was down to 1200 Life Points and Mak Set the Geargiarmor. Paglia blew away the Set monster with Dark Hole: Number 101: Silent Honor ARK survived with its effect. Paglia Set another Spell or Trap Card. Mak drew Mystical Space Typhoon, attacked, and Paglia flipped Artifact Ignition, destroying his own Set Artifact Beagalltach to Set Artifact Moralltach. Begalltach’s effect went off: Paglia Special Summoned it, activated its effect, and destroyed his Set Artifact Moralltach and Artifact Caduceus! He made Moralltach Chain Link 1, and Caduceus Chain Link 2; that let him draw a card with Caduceus, and destroy Number 101: Silent Honor ARK, but Mak cleared the field with Torrential Tribute. He Set one card to his backrow. Paglia Set one to his backrow and drew two cards with Cardcar D.
Mak drew Fiendish Chain and Summoned Geargiano Mk-II; when he Summoned Geargiano Paglia flipped Torrential Tribute, but Mak negated it with Wiretap! He made Wind-Up Zenmaines for extra security and swung on Paglia to win the Match! Thomas Mak moves on undefeated, one step closer to a repeat visit to the World Championship! Round 8 Feature Match: Brandon Wigley Versus Evan Petre QQ: Which Deck Do You Think Will Win This Weekend?